How can a six-inch light-gauge bendy wire outline have the weight of an elephant? Erin Knox achieves the seemingly impossible through a balanced dialogue between materials and subject in her work Carl the Elephant currently on display at Agnes Scott’s Dalton Gallery. The twisted wire line acts like a Möbius strip as it sets up the viewer to enjoy a descriptive and predictable outline, but quietly crosses over into the abstract as an ear becomes the space across and through solid planes and into another dimension—leaving the viewer intrigued and involved in figuring it out. This finesse of form creates an emphasis on the shape that is formed, and lends a weight to what is not there. 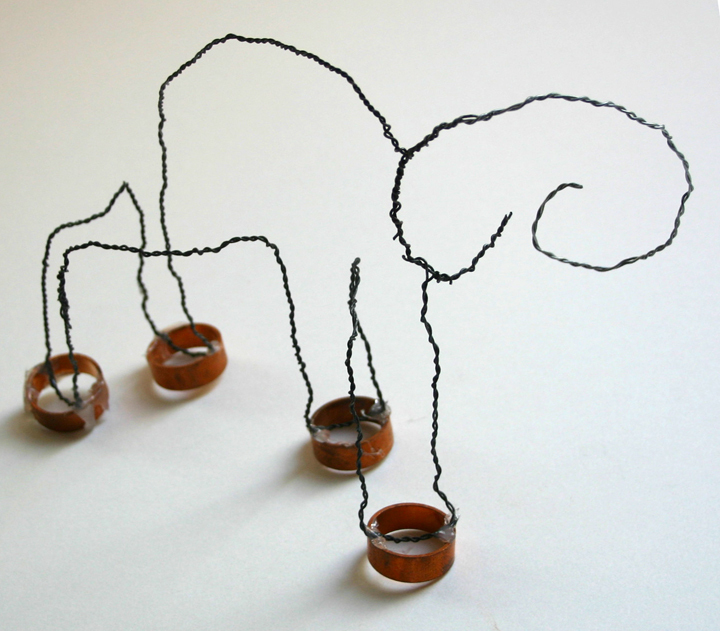 The juxtaposition of light wire with heavy copper rings placed on the bottom of each “foot” at the base of the figure suggests weight, balance, connection and attraction of the subject to the earth. As in Rachel Whiteread’s castings of empty spaces, the piece intrigues us through a simple physical form with complex intellectual implications.